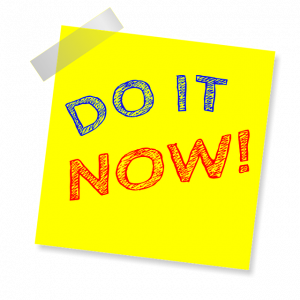 Following the introduction to procrastination in the Time Management Reality chapter, this chapter provides a deeper dive into understanding procrastination and finding solutions for it. Complete the exercise below to help you solve what is arguably the number one detriment to effective learning at school, home, and/or on the job (aka procrastination). This personal inventory is a bit different from others you may have taken. It incorporates very little about the usual bad habit suspects when it comes to the “P” word and includes more on the other reasons for such a habit, as suggested in the previous chapter as well as one or two other procrastination-inducers which have cropped up in our now social-media-saturated lives. Perhaps there is, in fact, more to your challenges with procrastination than the assumptions about laziness, disorganization, etc. See what you think. More importantly, see what you can do about it. For each item, circle one. And feel free to add any comments you wish. Sometimes quick-answer exercises like this just don’t have enough of YOUR personal response options, but try not to overthink things. This is, after all, a simple snapshot of where your beliefs and feelings are at this moment in time. As promised above, let’s get started with some immediate solutions as well as some perspectives that might, in time, help you adjust your thoughts and feelings regarding procrastination. How to Learn Like a Pro! Authored by Phyllis Nissila. Located at: https://openoregon.pressbooks.pub/collegereading/chapter/lesson-2-1-procrastination/ License: CC-BY Attribution. Adaptions: Removed one exercise, modified an exercise, removed information specific to Lane Community College, opinion article, and some hyperlinks for broader audience purpose. Next: Chapter 15: Words of Wisdom: Can You Listen to Yourself?